This article shows the process of configuring a standard cash drawer to open automatically when a receipt is printed. Most reliable and commonly used thermal printers can be configured to 'open' the cash drawer whenever a receipt is printed to them. This process is very similar for most receipt printers, but may differ slightly depending on the make and model. The cash drawer connects to your receipt printer, and is triggered to open when the a receipt is printed. 1. Plug the RJ12 connector cable (the one that looks similar to a phone line) from the cash drawer into the receipt printer. 2. Next, head to your computer's Control Panel and click 'devices and printers'. 3. 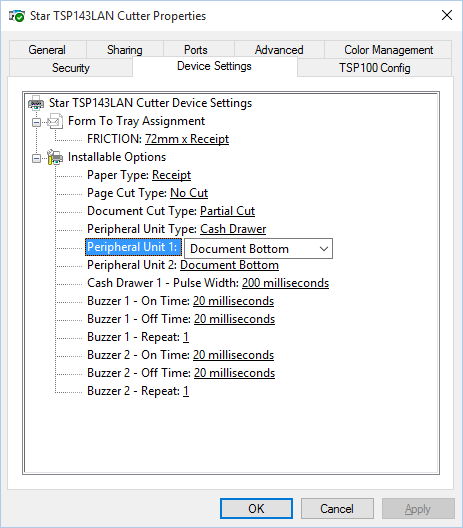 Right click on your receipt printer, select printer properties -> device settings. Tip: If you want your cash drawer to fire before the receipt prints you can set the Unit 1 and 2 options to 'Document Top'. 5. Save these settings and test it out by printing a ticket. 2. Next, click the magnifying glass in the top right hand corner of your screen and search for 'Terminal'. 3. Once in terminal, paste in 'cupsctl WebInterface=yes' and click enter. 4. Go to http://localhost:631/printers/. This will take you to CUPS. CUPS is a network printing service used by Mac computers. It allows you to setup your printers on a network, and customize options such as cash drawer setup, and you should be able to see your installed printers. 5. From here, select 'Cash Drawer Control', choose 'Open Drawer 1 and 2' under 'Cash Drawer' and click the 'Set Default Options' button below. Your cash drawer should now be all set to go! Test it out by printing a ticket.